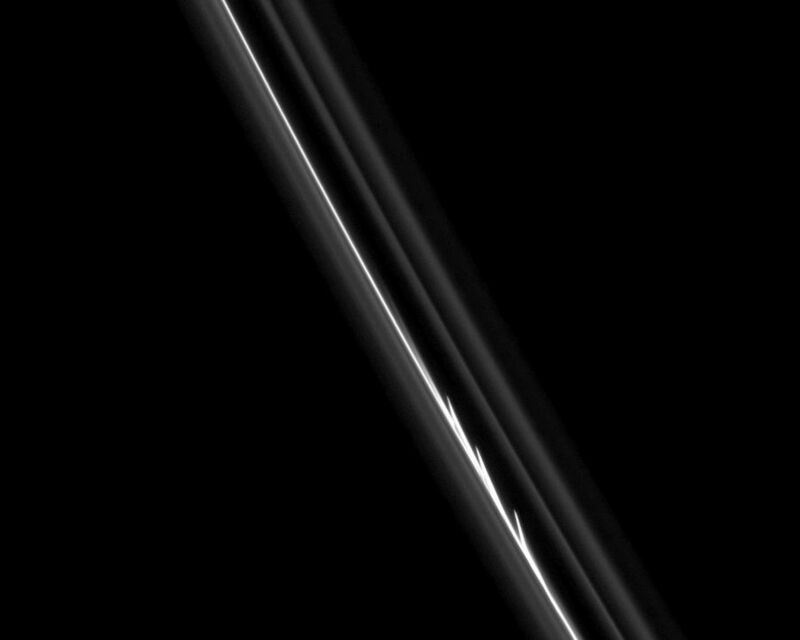 The three bright, finger-like jets of material seen here suggest that a small object has collided with the core of Saturn's F ring. Cassini spacecraft imaging scientists have shown that the F-ring shepherd moon Prometheus influences the structure of the ring in two ways: by creating streamer-channel features as it closely approaches (and partially passes into) the ring (see PIA08397) and by perturbing the orbits of small objects within the F ring region which then exert their own influence on nearby ring particles, as seen here. These small, embedded objects could be temporary clumps of particles, but scientists think at least one of the objects could be a more permanent moonlet. 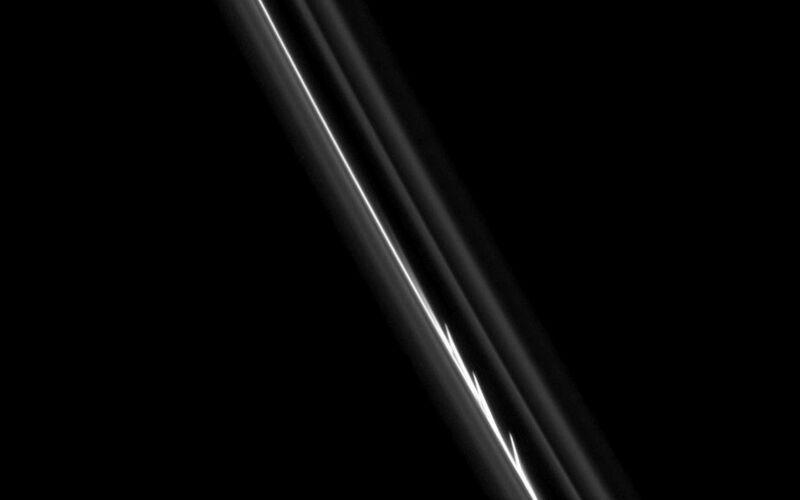 This view looks toward the sunlit side of the rings from about 40 degrees below the ringplane. The image was taken in visible light with the Cassini spacecraft narrow-angle camera on Aug. 20, 2008. 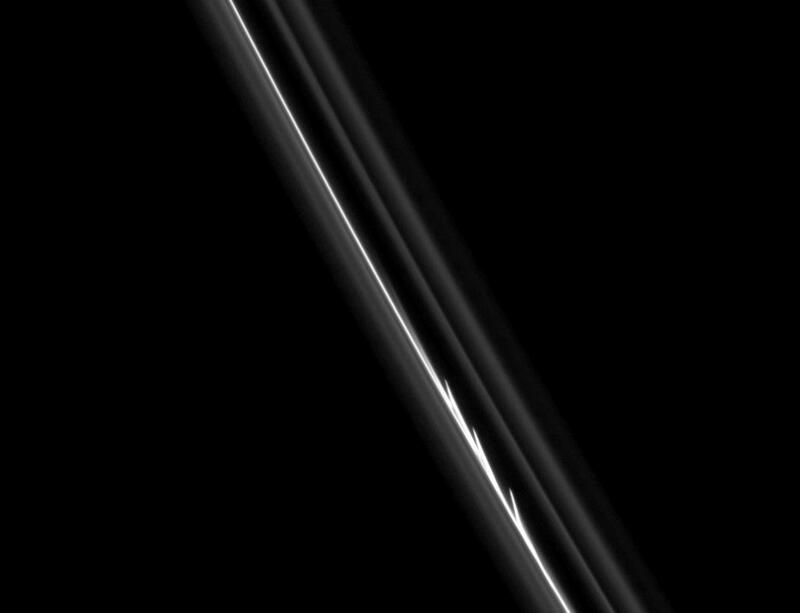 The view was obtained at a distance of approximately 685,000 kilometers (426,000 miles) from Saturn and at a Sun-ring-spacecraft, or phase, angle of 40 degrees. Image scale is about 5 kilometers (3 miles) per pixel.